A good set of makeup brushes can set you back up to $80 or more. DIY makeup tools may be all the rage on Instagram—using bobby pins to craft the perfect winged eye or using Kool-Aid as a lip stain—but have you ever thought of creating your own makeup brushes? Whether you’re a newbie to the makeup world and want practicing tools first, or you've been in the game for some time but can’t find the perfect substitute for a favorite eyebrow brush you lost, take a trip to your local craft store. Many of the materials used to make brushes can be found in their aisles. Or, take a look around your house. Before you toss that old toothbrush, repurpose it. A toothbrush handle or chopsticks can be transformed into makeup brush handles. Sponges or cotton work for makeup application, though obviously don’t use the gross sponge you use for washing your dishes! At a craft store, you’ll find wooden dowels or sticks which can be cut into different lengths for handles. They also stock hair, both synthetic and real, typically in the doll-making aisle. Feathers for a fan brush, cotton, foam, and sponges can sub in for expensive makeup store alternatives. Once you have everything you need, think about the types of brushes you want to make. Small and rounded to blend eyeshadow in your eye’s crease or angled to get that sharp edge on your eyeliner? As you think about this, give your supplies a good rinse—a good practice for all your makeup brushes. 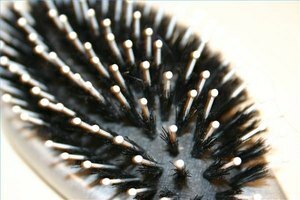 You will need to trim and cut bristles in the lengths and shape you need for your makeup brush substitute. Trace the outline of an existing brush that you want to copy onto a piece of paper and use this as your guide. Do the same if you’re trying to copy an expensive sponge. 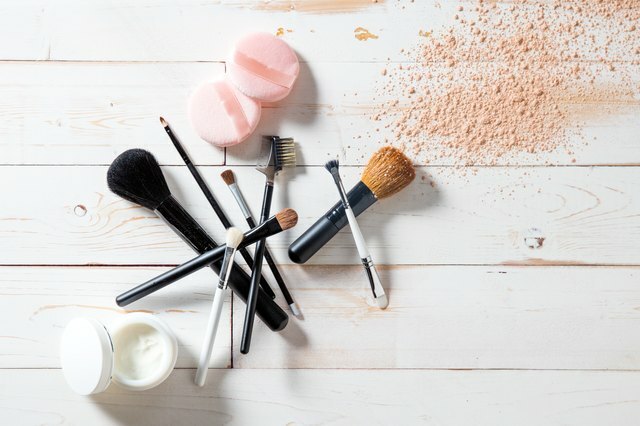 If you’re new to DIY makeup tools, start with easier brushes such as the face brush, which has a large, rounded head, or start with a blusher, which is slightly smaller than the face brush. It will be easier to trim them into the shape you want. Decide which of the materials you bought or found around the house will be used to create each brush. Will you use real or synthetic hair? Real hair creates a natural finish for most lighter facial products, such as powder or blush. Heavier creams and foundations work best with synthetic hair, which gives better coverage. Cut any hair, feathers, or sponges into the desired shapes. Use an Exacto knife or a sharp pair of scissors to get the most precise edge. With string or thread, bind them together. If you bought doll hair in strips, you can roll the strips and sew them together. Measure and cut the handles, which should all be about the same length. Then you can either glue them to a dowel or old toothbrush handle or remove the eraser from a pencil and glue hair in its place. Use epoxy, hot glue, or Krazy Glue, but make sure that it won’t dissolve in water the first time you clean your brushes. Wrap any glue-covered area with aluminum foil first and then wire. Cover part of the handle and the hair. After everything has dried, trim up any loose hairs or excess feathers. Cleaning your homemade makeup brushes is even easier than making them. Mix lukewarm water and mild shampoo in a bowl for an easy and cheap homemade makeup brush cleaner. Then reshape your brushes and let them dry. No longer will you sigh longingly when passing by the brush selection at Sephora. With a little know-how and ingenuity, you can learn to make your own makeup tools for a fraction of the price. Your blush never looked so good. Writer experienced in the health/wellness space.